License your own STYLING ACADEMY. 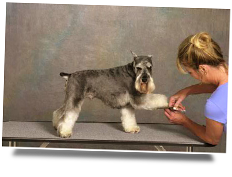 Learn Dog Grooming at Home! Learn quality styling skills to create any design. At Home! A personal instructor will review your work and communicate with you to help you achieve your goals whether to be employed or open your own business. Attend a Mini-Camp! At one of the Golden Paws Academies nationwide. This unique training method was created by Jacqueline Rauch and Mitzi Parrish, NCMG with over 40 years of teaching successful stylists at their state licensed schools. Both are accomplished pet stylists and have many years experience in salon development, operations, mobile grooming, boarding and license Golden Paws Pet Styling Academies around the nation that teach the proven successful Golden Paws Instructional Method nationwide. The Best option for a person who wants to learn pet styling is to attend a Golden Paws Academy full time as nothing can be better than an experienced instructor at your side to guide you and the opportunity to learn in a real world environment. While nothing can replace live daily instruction we realize some people simply cannot attend a school full time. This Long Distance training program is the next best option. It is absolutely the most unique, effective and best program to develop quality styling skills to groom all breeds and client requests. You choose the level of instruction you need. You will receive all the training you would at a Golden Paws Academy except at home at your pace, an instructor communicating with you each step via comments on your work. This is excellent for a self-starter. 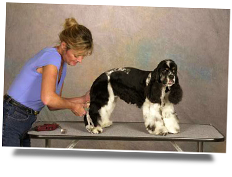 You will be grooming dogs as you would in a classroom and your instructor will make comments to improve your styling skills so you achieve the level to be able to be employed or start your own business. You can easily find the dog breeds needed through friends, family, and rescue groups or placing an inexpensive ad for the breeds you will need to work on. You and your instructor will work together to achieve your dreams! 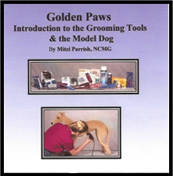 You may just want to improve your skills and chapters of the Golden Paws Complete Guide to Dog Grooming Book will be available along with our individual DVD’s will also be available at our online-store. Complete the full training program with a personal instructor to review and help you achieve your goals. Then attend a Golden Paws Mini-Camp 1-2 weeks or more if you desire. (at an additional fee) Go to School Locations and contact the school you wish to attend for pricing information. You must either complete the full program and then attend the mini camp or talk to Mitzi at 888-808-7297 or info@goldenpaws.com for other arrangements. You will receive a Certificate for display upon successful completion of the above programs. 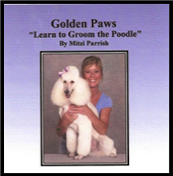 Order the Golden Paws Complete Guide to Dog Grooming and a full set of DVD’s. Note-Only individuals or Golden Paws Academies may use these programs, materials, books or DVD’s. They are not to be used by any other schools for teaching pet styling. 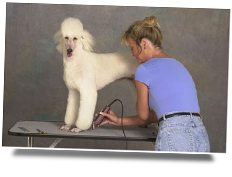 Golden Paws Complete Guide to Dog Grooming has 22 chapters, over 600 pages of complete step by step instruction with thousands of pictures and illustrations. This book is unlike any book on the market. It will truly take you step by step, just turn the pages and learn to groom and much more. There are over 14 hours of instructional DVD’s done in real time with instruction given during the whole process that will give you the knowledge to develop your styling skills and transfer them to all breed designs and client requests as well as speed techniques, safety, humane control positions, tips and tricks of pet grooming and more. 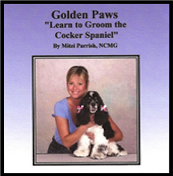 These DVD’s support the Golden Paws Complete Guide to Dog Grooming book. 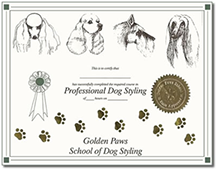 Golden Paws Program Overview Will inform you how easy this program is and the high quality of styling. 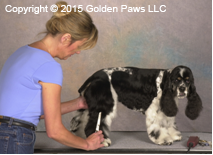 Golden Paws Control Positions How to humanely control the pet to have a great grooming experience. Business and Job Interview Information How to interview and business tips. How to properly Bathe and Dry dog’s. Without this knowledge you will not be able to develop the styling skills to be a great stylist. How to develop the styling skills to transfer to other similar designs. The Cocker Spaniel is very similar to the Springer Spaniel and many more similar breeds. With the skills learned you can follow an All-Breed Book or client request. If taking the Long Distance Learning Program the book and client information is included in the program. The Schnauzer is very similar to other Terriers. With the skills learned you can follow an All-Breed Book or client request. If taking the Long Distance Learning Program the book and client information is included in the program. The Teddy Bear Design is one of the most popular designs and can be put on many breeds. The Poodle is all about creating beautiful lines. Learn these skills and you can create many beautiful breed designs or client requests. 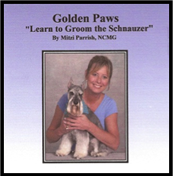 All DVD’s are done by Mitzi Parrish, NCMG and Co-Author of the Golden Paws Complete Guide to Dog Grooming Book. 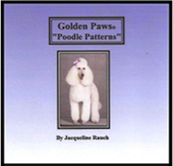 The Poodle Patterns DVD is done by Jacqueline Rauch one of the nation’s top instructors and Author of the Golden Paws Complete Guide to Dog Grooming Book. 1. The Golden Paws Complete Guide to Dog Grooming Book is $99.95. 2. Order the Golden Paws Complete Guide to Dog Grooming Book with a full set of the DVD’s for $534.54 (a $45.00 savings). Include a Personal Instructor for a Complete Program! 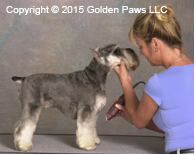 You can also have personal instruction, a step by step instructional booklet which includes how to get the dogs, open book tests and review of your practical application of your styling skills on different breeds by an instructor. You have a choice of submission of pictures, mini video cassette, or online through Skype. This includes hours of personal review and assistance to quickly develop your styling skills to become employable or open your own business. Everything is included and you will receive a Certificate upon successful completion. You have up to 6 months to complete the program (if needed an additional 4 months can be added). Cashiers Check, Master Card, Visa or other financing the student obtains. The school offers no payment plans at this time. Monthly payments on credit card can be scheduled with the school director. Golden Paws Program Overview which also has the Control Positions and Business Tips on it. * With the purchase of this student package: 3-16oz bottles of Bark2Basics shampoo consisting of De-Mat Conditioner, Sensi-Skin and Oatmeal shampoo will be include at no charge. Below are some optional tools and miscellaneous items you may want to get. You can get them at Groomers Choice Pet Products. Scissor Adjuster or a Flat Head Screwdriver: Used to adjust tension if needed. If they are tight they will wear on your hand and make it difficult to cut the hair smoothly. If too loose, they will not cut the hair. 2-Rubber Mats: 1 for the dogs to stand on in the bath tub and 1 that will be used on the table while the dog is being dried and or groomed so they are not sliding around on a slick surface. Cotton Balls, Q-Tips for cleaning the pet’s ears. Drying Table: Can double as your grooming table. You will need some type of table to put the pet on while drying and grooming. If you cannot afford a professional table you can always use any table as long as it sturdy and wide enough for the pet to stand on. If you get a professional table (there are some inexpensive ones) get a grooming arm and grooming loop to attach to the table. Just remember safety, never leave a pet unattended. You can get these products and more at Groomers Choice Pet Products. Fabric & Pinking Shears: Bandanas for the pets. You can usually pick up the fabric from Walmart for approx. $2.00 a yard. Ribbon & Grooming Bands: For Bows. You can either buy pre-made or make them yourself with the ribbon and grooming bands. Camera & Photo Album (Look Book): To take your before and after photos and arrange them for your “Look Book”. Camcorder: For your final exam. The Golden Paws Long Distance Learning Course is the easiest, most thorough and well rounded pet styling program developed by Jacqueline Rauch and refined with 40 years of teaching successful students. 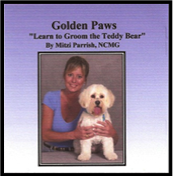 Mitzi Parrish certified master stylist, co-author, developer and instructor of Golden Paws Pet Styling Academies and the Long Distance Program. She will either instruct you herself or you will have an approved instructor trained by her. We focus on training you to acquire quality styling skills to become a professional groomer that is what we do best, teaching. We want to help guide you if you want to open your own business whether it is home based, salon or mobile. We will give you the information where to get the best developed business programs, vans and more. In the Golden Paws Program Overview DVD Business and Job Interview Information portion we show you where and how to apply for a job. You will also develop through the course a “Look Book” of your work to show your clients or future employer. We will teach you to be the best at whatever level you choose in pet styling. The sky is the limit and our goal is to make your dreams come true and help you accomplish your goals! Now is the time to get started! The pet field is growing by leaps and bounds and the career is in high demand. Copyright © 2015 Original Golden Paws LP. All Rights Reserved.